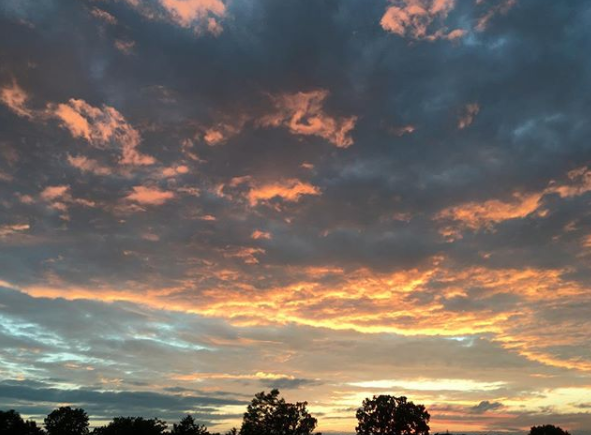 One of the redeeming qualities of the Midwest, according to Eric, are the region’s spectacular sunsets. 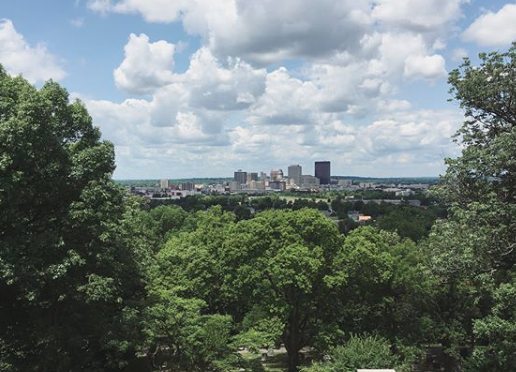 A view of downtown Dayton, Ohio from the vantage of Woodland Cemetery. Eric’s scholarship focuses on the history of political struggles in mid-sized towns of the Rust Belt. He feels validated that PBS’s Frontline recently decided to air a documentary on Dayton. “I am a writer,” says Eric Rhodes. “But I don't want to write history that only twenty academics will read.” Eric urges historians to write for a public audience. “Historians were once more engaged in public intellectualism. Luckily, we've seen a resurgence of interest in history in the past few years. History should inform the present.” In his opinion, the past must be usable. Eric is usually in his office at Miami University (a public university north of Cincinnati) by 8am. His Master’s program requires a lot of work, so he often doesn’t leave the campus until 10. When he’s not attending class or reading, he’s editing book reviews for the journal Origins: Current Events in Historical Perspective. Or co-hosting a podcast called History Talk, where he dissects the history behind contemporary issues. He’s working on a couple of conference papers as well as a book chapter about the development of Midwestern identity in Cincinnati during the early 19th century. "I can't figure out what to think about 'Midwestern nice,'" he muses. "People, mainly from the East Coast, have called me a phony for being 'nice.'" The native of Akron has created a distinction between "nice" and "kind." "A kind person will tell you that you have spinach in your teeth. A nice person won't," he explains. Eric is deeply concerned about inequality, and this pervades his academic interests. His hometown is an upper-middle class, predominantly white suburb, where many managers working in the rubber industry settled. Growing up in a racially and economically fractured Midwestern metropolis influenced his decision to study the history of residential segregation in American cities. "My parents sent me to a charter school in inner-city Akron when I was a kid, which was much more diverse than my neighborhood school. After I transferred to my neighborhood public school, I recall a teacher asking our class to draw a picture of a friend and write their name. I chose one of my friends from the charter school, who happened to be black. I asked my teacher how to spell his Afrocentric name. She informed me that it was 'not a real name.'" In an effort to bolster the sagging housing market during the depths of the Great Depression, the Home Owners’ Loan Corporation (HOLC) used metropolitan racial demographics to institutionalize segregation in almost 200 American cities. The HOLC codified municipal racial demographics in the form of color-coded maps and recommended that banks would have a higher mortgage return in all-white (Anglo) neighborhoods. Dayton lending institutions discriminated against black and Jewish Americans, as well as Eastern European immigrants by refusing them credit for housing. Eric’s interest in urban history was piqued by a recent trip to Mexico City. Green-Wood Cemetery in Brooklyn holds Eric’s favourite view of Manhattan. RS: What is your master’s thesis about? ER: My master’s thesis is about Dayton’s pioneering effort to integrate the suburbs in the early 1970s. Corporations played a surprisingly supportive role in the effort. General Motors executives called up their employees and threatened them with their jobs if they opposed the plan. It turns out, however, that the way that Dayton went about increasing housing opportunity promoted economic, not racial integration. And shifts in economic ideology and the landscape of the rapidly rusting Steel Belt by the end of the 1970s meant that business elites were either no longer interested in promoting the public good or that they skipped town entirely. RS: How should white people disseminate actionable information as to how to prevent discrimination (i.e. the redlining you mentioned)? ER: I’m biased, but the best way to prevent future discrimination in my opinion is to learn the history of how public, private, and individual actors helped to create the fractured and unequal society in which we live. We won’t be able to confront this legacy without government intervention. Public policy was a decisive factor in creating this mess, and it’s our best avenue for cleaning it up. ER: Say less and do more. I admire people who listen well. When they do chime in, they usually have the best ideas. RS: What are your favourite websites? ER: I check the Backstory, Nostalgia Trap, and Past Present websites regularly. For inspiration, I read the articles curated by longform.org. RS: Do you get sidetracked easily? ER: While researching my topic, I often get sidetracked by footnotes. I'll be reading about Dayton's housing integration plan of the 1970s and will see an article on the development of funk on that city's West Side. If you want to become a professional scholar, you've got to be ruthlessly single-minded: stick to your argument. RS: What do you listen to while you're writing? ER: Some academics like to listen to classical music while they're writing. I prefer jazz. I've been listening to a lot of Art Blakey and Kamasi Washington. I also enjoy this particular collection of African music from the Upper Volta region: Bobo Yéyé: Belle Époque in Upper Volta. It’s a real melange of French and Indigenous influences. And also instrumentals to my favorite rap albums (36 Chambers by Wu-Tang is one). ER: That's a hard one. One that stands out is Perfume Genius. ER: Larry David. And Ilana Glazer. ER: I'm very much an indoor person. My favorite place is my office, surrounded by my books. But I need to take walks to clear my head. RS: And you like to spend time in a special cemetery. 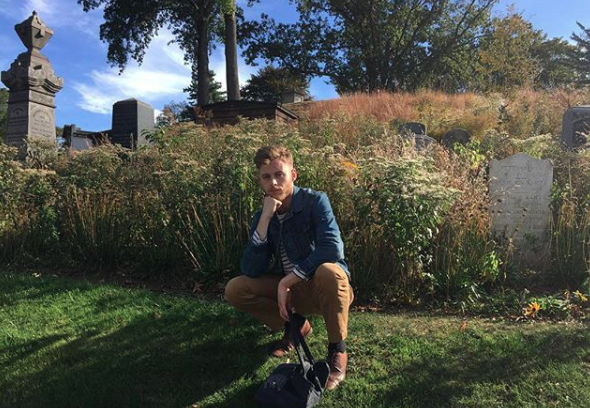 ER: Probably my favorite place on earth is Green-Wood Cemetery in Brooklyn. It dates back a time when Americans were less squeamish about death. Green-Wood was one of the country's first rural cemeteries. It was a huge tourist attraction, charting upwards of 500,000 visits per year by the 1850's (bested only by Niagara Falls). People used to picnic there, and apparently it was a popular lover's retreat. I like taking in the view of the Manhattan skyline among the likes of Jean-Michel Basquiat, Margaret Sanger, Leonard Bernstein, James Weldon Johnson. It's less crowded these days, and when I go it's usually just me, my thoughts, and Green-Wood's long-term residents. It's quiet. Especially in the autumn. RS: Tell me about your recent trip to Mexico City (North America's largest metropolitan area).